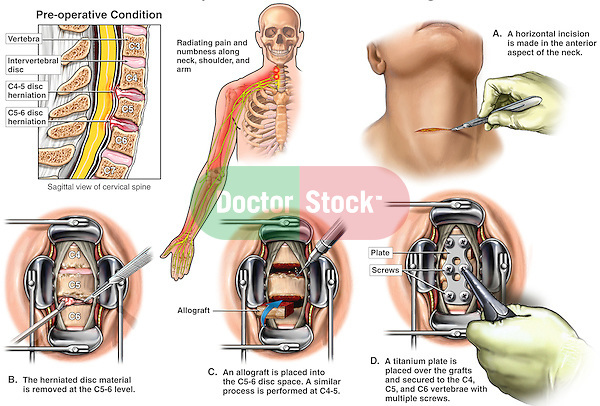 Spine Surgery - Herniated Discs with Anterior Cervical Spinal Fusion Procedure. The following images are shown in this series of medical illustrations: 1. pre-operative sagittal cut-away through the spine revealing disc herniations at C4-5 and C5-6, 2. Right arm pain and radiculopathy, 3. Surgical incision into the neck, 4. Two level disc removal, 5. two level Preparation of the fusion sites, and 6. Placement of bone graft and fixation plate and screws fusing C4-C6.